The new console runs faster when docked. Much faster. Spec reveals are never easy. Months - sometimes years - of anticipation build after initial teasers. Rumours circulate, patent applications are scoured for hints of what the platform holders might be planning, anonymous sources spring up telling us exactly what we want to hear - and then reality hits. Recently, Venturebeat essentially reconfirmed a Digital Foundry report from July, revealing that Nintendo Switch is based on Nvidia's Tegra X1, featuring a GPU based on second generation Maxwell technology. For those hoping for Xbox One power in a portable, it was a blow. Uncertainty remains on how Nintendo has customised the X1 processor, but we can go one step further today in revealing how the power of the console adjusts as Switch transitions from home console into a full portable. But first, let's dissect the Venturebeat story a little and add our own flavour. In April this year, we first learned that Nvidia tech was 'inside' the Nintendo NX, as it was known then. Further sources came forward across the months to corroborate the story, then sometime in July, Nintendo of Europe held a large event at its Frankfurt HQ where the kit was demoed in action to a very large audience. Both Digital Foundry and Eurogamer now had all the confirmation required to run our stories. From our perspective, the next step was to push further and hammer down the final specification - but this was not easy. In our story, we speculated that the March 2017 release would allow Nintendo to transition from the Tegra X1 to the more modern Tegra X2 utilising Pascal technology using a FinFET processor production technology, opening the door to better performance and/or longer battery life. Nvidia itself claimed that the custom processor in Switch is based on 'the same architecture as the world's top-performing GeForce gaming graphics cards' - seemingly a stone-wall indicator that Pascal was in Switch (all of the most powerful GPUs on the market when that statement was made were based on Pascal, after all). Now, to be fair to Nvidia, Tegra X1's Maxwell was the final iteration of the architecture and does have technological aspects that are found in Pascal: specifically, double-rate FP16 support. We're also told that Switch has bespoke customisations that may involve pulling in other Pascal optimisations. And it's also worth noting that at the nuts and bolts level, Pascal and Maxwell are already very similar. So with that in mind, the main difference comes down to the process technology: 20nm in Maxwell, 16nm FinFET in Pascal. Regardless, behind the scenes, sources inform us that Nintendo continued to brief developers with a spec that is uncannily similar to this Twitter leak that actually surfaced before the official reveal - and in crucial areas, it's a match for a stock Tegra X1. This leaked spec actually appeared on Twitter before Nintendo's official reveal. Thought by many to be out of date or fake, we can confirm that Nintendo has briefed developers recently with the same information. One source tells us that the 4K30 aspect of the spec was not part of the developer presentation, but everything else was. We can assume that the clock-speeds are theoretical maximums, and not the 768/307.2MHz combo we've confirmed as locked in retail hardware. There are some anomalies and inconsistencies there that raise alarm bells though. Tegra X1 is a fully-featured HDMI 2.0 capable processor, so why is video output hobbled to HDMI 1.4 specs? What's the point of a 4K, 30Hz output? The X1 also has 16 ROPs, so why is pixel fill-rate mysteriously running at only 90 per cent capacity - the 14.4 pixels/cycle should be 16 were this a standard Tegra X1. Nvidia's chip also has four ARM Cortex A53s in combination with the more powerful A57s - so why aren't they on the spec too? (In fairness, the A53s didn't actually see much utilisation based on Tegra X1 benchmarks). Other areas of the spec have since been corroborated by Eurogamer: specifically, the 6.2-inch IPS LCD panel with a 720p resolution and multi-touch support, but there is the sense that this is an old spec, that there's a crucial part of the puzzle still missing. Rich and Tom sit down to discuss the recent Switch spec reveal, plus discussion on the system's clock speeds. 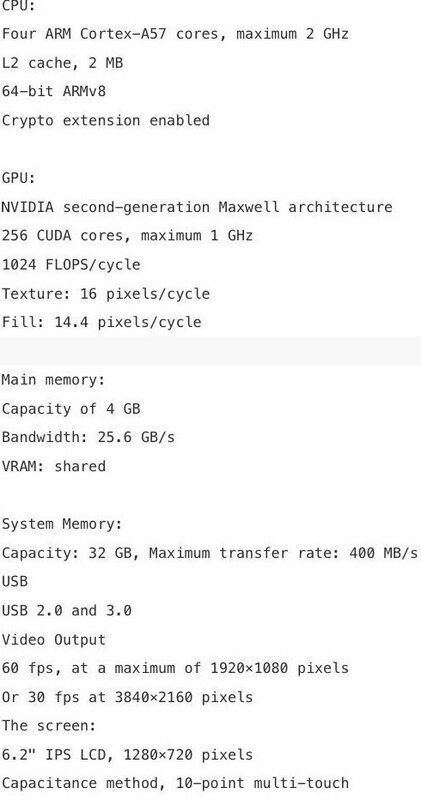 CUDA core count and memory bandwidth are certainly in line with a standard Tegra X1, but critically, the leaked spec is extremely vague about the actual speed of the CPU and GPU, referring only to the maximum speeds seen on Nvidia's Shield Android TV micro-console. Assuming that Switch uses the same 20nm process technology as Shield, those clocks were never going to be attainable for a relatively small, handheld, battery-powered console. The Venturebeat story suggests that Switch is still using 20nm technology, but right now, this remains unconfirmed. Clock-speeds are a crucial piece of information required to get some idea of Switch's capabilities beyond the physical make-up of the Tegra processor. As many have speculated, the new Nintendo hardware does indeed feature two performance configurations - and the console is categorically not as capable in mobile form, compared to its prowess when docked and attached to an HDTV. And we can confirm that there is no second GPU or additional hardware in the dock itself regardless of the intriguing patents that Nintendo has filed suggesting that there might be. With battery life and power throughput no longer an issue, the docked Switch simply allows the GPU to run much faster. And to put it simply, there is a night and day difference here. Where Switch remains consistent is in CPU power - the cores run at 1020MHz regardless of whether the machine is docked or undocked. This ensures that running game logic won't be compromised while gaming on the go: the game simulation itself will remain entirely consistent. The machine's embedded memory controller runs at 1600MHz while docked (on par with a standard Tegra X1), but the default power mode undocked sees this drop to 1331MHz. However, developers can opt to retain full memory bandwidth in their titles should they choose to do so. As things stand, CPU clocks are halved compared to the standard Tegra X1, but it's the GPU aspect of the equation that will prove more controversial. Even while docked, Switch doesn't run at Tegra X1's full potential. Clock-speeds are locked here at 768MHz, considerably lower than the 1GHz found in Shield Android TV, but the big surprise from our perspective was the extent to which Nintendo has down-clocked the GPU to hit its thermal and battery life targets. That's not a typo: it really is 307.2MHz - meaning that in portable mode, Switch runs at exactly 40 per cent of the clock-speed of the fully docked device. And yes, the table below does indeed confirm that developers can choose to hobble Switch performance when plugged in to match the handheld profile should they so choose. As things stand, a docked Switch features a GPU with 2.5x the power of the same unit running from battery. And while some questions surround the leaked specs above, any element of doubt surrounding these CPU and GPU clocks can be seemingly be discounted. Documentation supplied to developers along with the table above ends with this stark message: "The information in this table is the final specification for the combinations of performance configurations and performance modes that applications will be able to use at launch." So how will this differential affect the games we play? The Switch handheld screen has a 720p resolution - so the gulf in GPU clocks means that in theory at least, there's overhead there to run a 720p mobile title at 1080p when docked. One developer source likens this to creating two different versions of the same game - almost like producing a PS4 game and a PS4 Pro variant. At the very least, QA will require titles to be tested thoroughly in both configurations, plus a lot of thought will be going into exactly how to utilise GPU power in each mode. But perhaps the biggest takeaway from this is that those hoping for Switch to bring Nintendo back into contention with Microsoft and Sony's hardware should temper expectations. While there will be multi-platform projects (a point Nintendo made in its reveal with the Skyrim footage), we should not expect to see Switch versions of cutting-edge blockbusters. That should be fairly obvious when we consider that Xbox One S uses 16nm FinFET technology with gaming power draw in the region of 75-80W. Nvidia's GPU technology is more power-efficient, but it stands to reason that a mobile device (which typically operate with a 5-10W power budget) won't be in the same league. But from a different perspective, this makes what we have seen even more impressive. Nintendo's hardware is all about an all-in-one console you can take anywhere while continuing to play the same games. We fully expect to see the kinds of fare displayed in the reveal trailer fully realised: Nintendo doing what it does best, basically. Even a 307.2MHz GPU based on Maxwell technology should be capable of out-performing Wii U - and certainly the Zelda: Breath of the Wild demo seen recently on the Jimmy Fallon show revealed a level of performance significantly smoother than that seen in last year's E3 code running on Wii U hardware. We should also remember that Nvidia has produced a bespoke software layer that should allow developers to get much, much more from the processor compared to what we've seen Tegra achieve in the Android-powered Shield console. How one update ended a six-year career. Although the picture on Switch's technological make-up is now coming into focus, our enquiries continue. We know how fast it runs, but what are the custom modifications that set apart the bespoke Tegra from the stock X1? While we're confident that our reporting on Switch's clock-speeds is accurate, all of the questions we have concerning the leaked spec remain unanswered. Those anomalies still seem odd, and details of the processor's customisations remain unknown at this time. Has Nintendo added a bunch of smaller tweaks or has it been a little more ambitious? Performance at lower clocks could be boosted by a larger GPU (ie more CUDA cores), but this seems unlikely - even if Switch is using newer 16nm technology, actual transistor density isn't that different to Tegra X1's 20nm process - it's the FinFET '3D' transistors that make the difference. A larger GPU would result in a more expensive chip too, with only limited performance gains. And if Switch is using a more modern 16nm Tegra chip, we would expect Nintendo to follow Nvidia's lead in how the new process is utilised. However, the Tegra X2 features the same CUDA core count and apparently boosts GPU clocks by 50 per cent, the opposite direction taken by Nintendo. Specs are one thing but the games are quite another and what we've seen so far certainly looks impressive bearing in mind that Switch has to operate effectively as a handheld device with a tight power budget. We'll be looking forward to the Switch reveal next month for the full hands-on experience, but clearly with these specs in mind, the focus will be on the console's defining feature - the ability to run the same games on an HDTV or on the go. Resolutions aside, will we actually be able to tell the difference or is the experience as seamless as the reveal trailer suggests? We can't wait to find out. In the meantime, Nintendo has yet to respond to our request for comment.